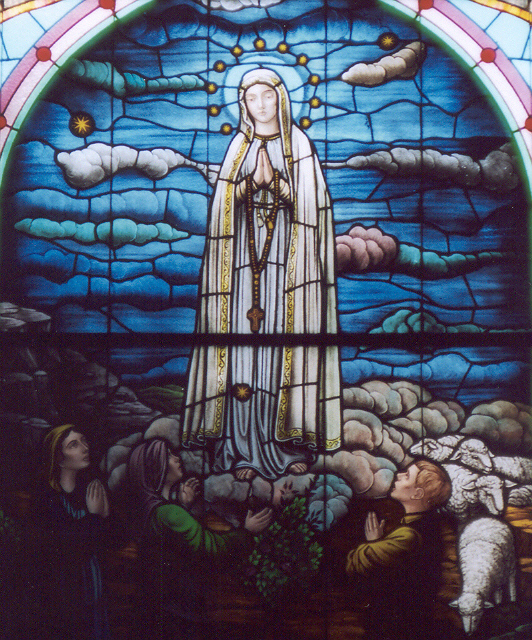 This past Thursday, the Church universal celebrated the memorial of Our Lady of Fatima - commemorating the first of her six apparitions in Portugal in 1917. In these apparitions, our Lady called the faithful to pray for a number of intentions, one of which was the recitation of the rosary for peace. Keep in mind the timeliness of this request: Europe was just coming out of World War I and Russian Communism and its budding atheism was in its early stages. Praying for peace was an intention in the hearts and minds of many persons. In our own day, there are other calls for peace. In recent months, we have witnessed demonstrations worldwide seeking peace. Some want the United States to withdraw from Iraq, which they believe will bring an end to the armed conflict in that country. Some think that we should have never gotten involved in the first place. As a Church, we are always praying for peace - an end to violence and conflict in our families; in our schools; in the womb; and in the human heart. These are all very worthwhile intentions but the meaning of the "peace" can be sometimes misleading, if we understand "peace" in the context of today's Gospel. Most persons think that "peace" is merely the absence of war or conflict or violence. While the absence of these things can be an effect or result of peace, the absence of conflict or violence by itself is not a guarantee of peace. For example, our troops in Iraq may be able to keep civil order, a type of "peace," but they may not necessarily be very successful in winning over the hearts and minds of the Iraqi people so that they "buy into" the benefits of civil order and the prosperity that can result from it. Merely keeping civil order in a country is no guarantee of a true and lasting peace. Pope Paul VI once said, "If you want peace, work for justice." True peace exists in this world when justice is a reality. Similarly, St. Augustine once wrote that peace is the tranquility of order - the work of justice and the effect of charity, of love. So, peace cannot be achieved on earth without safeguarding the goods of persons and the respecting of all human rights - all persons, from the unborn to the aged and dying. On a more local level, we see areas in daily living where peace is the goal of individuals but it is a transitory peace - just an absence of conflict. We see this often in families. Parents wish that if they could just get their children to stop fighting or bickering, then peace is achieved. Spouses wish that in-laws could just "get along" and peace would be a reality. This is just half the story. Again, peace is not merely the absence of conflict: rather, true peace exists when justice exists - that is, every person receives what they are owed; when there is reconciliation between enemies; when there is conversion in the hearts of individuals to transcend so much of the pettiness that stifles authentic family life. It has to begin with us - to be bigger than all those little things that keep us from achieving the harmony that the Lord so badly wants for us. This goal of achieving peace by God's grace was so important to our Lord that he says that "Blessed are the peacemakers, for they shall be called children of God." So, the Gospel today suggests another kind of peace - the peace that only Christ can truly supply - the one and only true peace that can really win hearts and minds, whether that be in Iraq or in Westmoreland County. I want to borrow from the excellent Gospel commentary that of of my brother priests, Fr. John DeCelles wrote in this week's Arlington Catholic Herald. Fr. DeCelles says that the peace that Christ offers is not just the tranquility of a quiet place to pray or the simple extending of a cordial greeting of "peace." Rather we ought to look back when true peace existed on this earth - back in the day of Adam and Eve before the Fall of man. Since then, true peace has never really existed on earth in totality - in the same way that it did before Adam and Eve committed sin. The real peace that we should have our sights on is the peace that exists between the three persons of the Trinity: Father, Son and Holy Spirit. In other words, heaven is the perfection of peace. In the end, that's where peace resides - in the very inner life of God. Notice that Christ speaks of peace within the context of statements He makes about his relationship to the Father and the Holy Spirit. That's where true peace reigns. Thankfully, we can participate in that peace even to a limited degree in this life: through baptism, the inner life of God dwells in our souls and in the Eucharist - the gift of peace is given once again. That is why we have the Rite of Peace or the Exchange of Peace right before we receive Holy communion - we recall that receiving Holy Communion is an entry into the peace that only Christ can give. Unfortunately, the Rite of Peace can turn into a type of circus, with people reaching over pews to extend what is really a transitory greeting of peace. Rather, we should be focusing on the perfect peace communicated to us in the Eucharist that we should be preparing to receive. When we hear the words of the Mass, "my peace I give you" we should focus on that perfect peace that God created us for and which the Eucharist restores - the perfect peace of paradise that was once ours in the Garden of Eden, was sadly squandered but thankfully has been restored in the person of the Prince of Peace - the Lord Jesus Christ! Praise be to the Lord Jesus Christ. Now and forever, Amen!